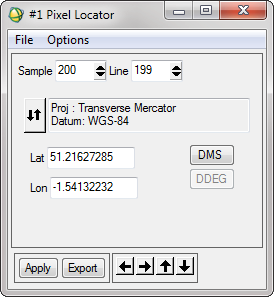 Summary: When you use the Pixel Locator or Cursor Location/Value tool in ENVI, the latitude and longitude co-ordinates given are based on the datum that the image is in, not necessarily WGS-84. 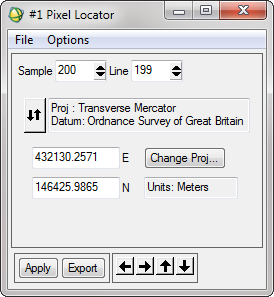 Very handily, all of these values are updated as you move around the image manually – so this dialog can also be used as an equivalent of the Pixel Location/Value window – as shown below. 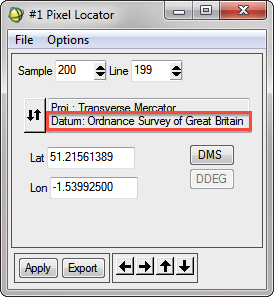 This seems like a sensible thing to do, but it makes comparison with latitude and longitude co-ordinates from other sources very difficult – as nearly all other latitude and longitude co-ordinates are provided in the WGS-84 datum. Locations from GPS systems are always in WGS-84, and locations on web maps, in GIS systems and most other sources of latitude and longitude co-ordinate systems are very frequently in WGS-84. Well, I haven’t yet done a full investigation of this (sometime I will sit down and write some code to do some proper testing), but when I found the problem it was causing offsets of around 100-200m – which can be quite significant in many applications. Unfortunately, this means that the map co-ordinate values (for example, the Ordnance Survey Grid References) will now be wrong, and you’ll need to switch back to the original datum to get those to be correct. 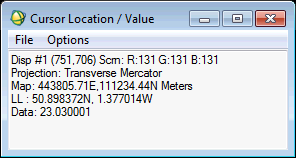 Also, I can’t find a way to get the Cursor Location/Value dialog to display WGS-84 latitudes and longitudes. I actually found this while designing a lecture and practical session for MSc students at the University of Southampton on using the ENVI API in IDL. 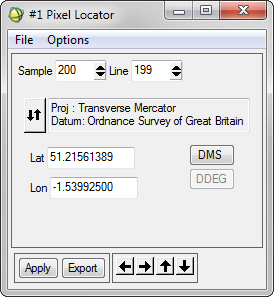 While writing a code example for the students on finding the pixel value at a specific lat/lon co-ordinate, I found that my results came up between ten and twenty pixels away from the place I thought they would (I was using 10m SPOT imagery), and I got different results from my IDL code and ENVI – even though my IDL code was using the ENVI API! Luckily I managed to find out what the problem was – and could therefore explain it to my students, and hopefully stop them running in to the same problem as me. It may be that I’m being silly here, and everyone naturally realises what ENVI does, and thinks it is the right thing to do – but it definitely confused me, so maybe it will helped you.